Paint is a good choice as a wall and ceiling coverage and the right one can make all the difference in any room. It is not only a beautiful addition to your interior design but also its film works as protection from mold and mildew especially in rooms like kitchens and bathrooms. Water won’t penetrate the painted surface and it will prevent fungi from growing there. When it comes to the election of paint, you need to decide which finishes and colors you desire. Those selections better to make after you opt for your room decors. That way it will be much clear for you to see and imagine your overall design. 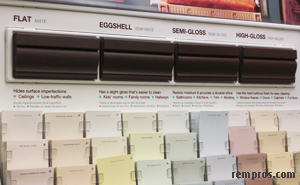 While picking paint finishes your choice will depend on your house area whether it is a kitchen, kid’s room, or bedroom. Normally for rooms with high traffic areas it is recommended to apply durable and easy to clean options, such as semi-gloss or high-gloss. Despite the fact that some people may say to choose paint finishes is relatively an easy task, homeowners should be careful even with that decision because their walls and ceilings might look poor if not appropriate finish will be chosen. While picking cheapest paint consider the fact it might increase labor cost to paint a house because of an extra coats might be necessary to apply to get better results. Choice of colors will depend only on your preference. Paint comes in almost infinite array of colors which makes it somewhat harder to choose the right one. You can choose warms (orange, red, pink) or cool (blue, green, violet) colors or mix any of those. Since opting for the color is one of the most difficult tasks, it is better to check online (do some homework) and see what is available on the market now. After that you can head directly to stores and consult with in-stores experts. In addition, it is wise to keep notes as you shop to be sure you choose the best option for your home and don’t lose track of your findings. After collecting a few samples with name of the stores where you get it, you can sit home in a quiet and not distracting place and decide which one will work for you without any haste. Even if you might feel lost in so huge variety of color options, you should be patient and maybe leave your final decision for the next day. In any case, you need to make that selection yourself in order not to regret that you listen to someone’s advice which will not work as you wanted in the result. Paints can be latex (water-based) or oil-based. Nowadays almost all homeowners and remodeling contractors start using latex paint for interior designs projects. They do that because it is easier to work with this type of paint and clean applications, such as brushes and rollers after the job is done compare to oil-based one. Water-based paint will dry fast, so in about one hour you can put another coat and finish your project in one day. If the area you want to cover is not too big. Now manufacturers lean to produce paints with natural ingredients, such as plant resins, minerals, clay, and milk casein rather than based on petroleum and chemical products. It makes the paint be safer even when it is still wet. They also improve and designed new formulas which are special for a particular room in the house. For example, such paint was designed for the bathroom to resist peeling and blistering. Also it is scrubbable, tough, fade resistant, and non-yellowing.